The valley of Sausal Creek below Dimond Canyon made a natural site for orchards: a nice flat floodplain with decent soil and a permanent stream off on the western side. Also, the valley is straight to a degree that strikes me as unusual, which is handy for laying out blocks of land. It may or may not have been filled with oaksI have a copy of an old print titled “Oaks of Oakland” that purports to be from this area. In any case it has a classic shape with a flat floor and steep sides formed by the Oakland alluvial fan (the Fan). I’ve shown the high, landslide-prone western side before; here’s the eastern side. 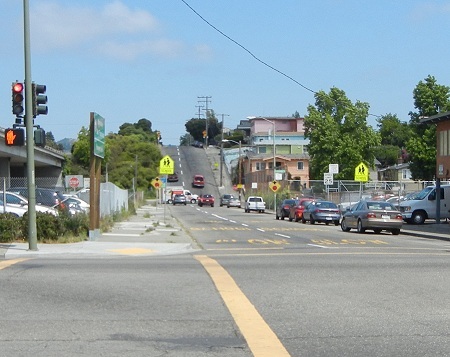 This is the view from the Fruitvale freeway exit looking up Harold Street, where the valley wall is pretty dramatic. Farther down, the valley wall fades away well before you get to Foothill Boulevard, which everywhere marks the edge of the Fan. Here at Fruitvale Boulevard and Bona Street, the valley wall is already lower and more subdued. It looks like I’ll name this lobe of the Fan the Patten lobe. The valley of Peralta Creek is just over the hill. It’s interesting to speculate why the Peraltas put their rancho buildings there rather than here. This entry was posted on 27 June 2013 at 8:10 pm and is filed under Oakland geology views, Sausal Creek watershed, the Fan. You can follow any responses to this entry through the RSS 2.0 feed. You can skip to the end and leave a response. Pinging is currently not allowed. this is my neck of the woods and a topic i spend a lot of time on – what grew where. i don’t think there’s any doubt that this was oak woodland / riparian zones throughout this area. of course there were ‘sausals’ or willow thickets, but surrounding those would be oak / bay woodlands. 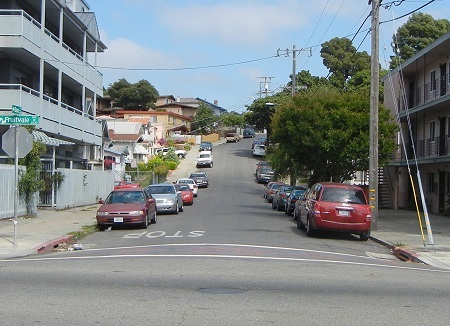 the peralta lowlands is a very cozy valley compared to what must have been a very exposed area – once the oaks were removed – in the fruitvale slopes. we have the richest soil in the area by far, plenty of moisture year round, and a cozy little valley to call home. when the oaks were removed at settlement, the exposure – particularly to the sun, must have been severe and unrelenting. thanks for another great posting!